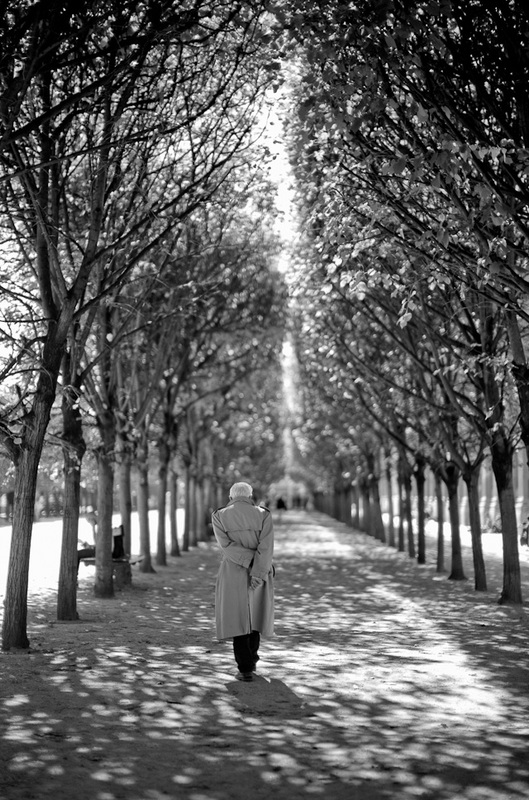 leica.overgaard.dk - Thorsten Overgaard's Leica Pages - The Story Behind That Picture 105 - "A Moment in Paris"
The Story Behind That Picture: "A Moment in Paris"
My experience is often that the first photo in a series is the best. If I should back up the experience with an explanation, I think that is when you see the photo, that is the photo, clear and uncluttered. The more you modify it, the more speculative it becomes. I try to tell my self to shoot when I see the picture, even if I am not sure the focus is there (becasuse some times it is; or will be so quickly that the first or second shot is in focus). Then I improve the focus, the angle and start thinking how to make it better. What should be in the frame, and what should not, for it to work. My contact sheet of the man in the park. 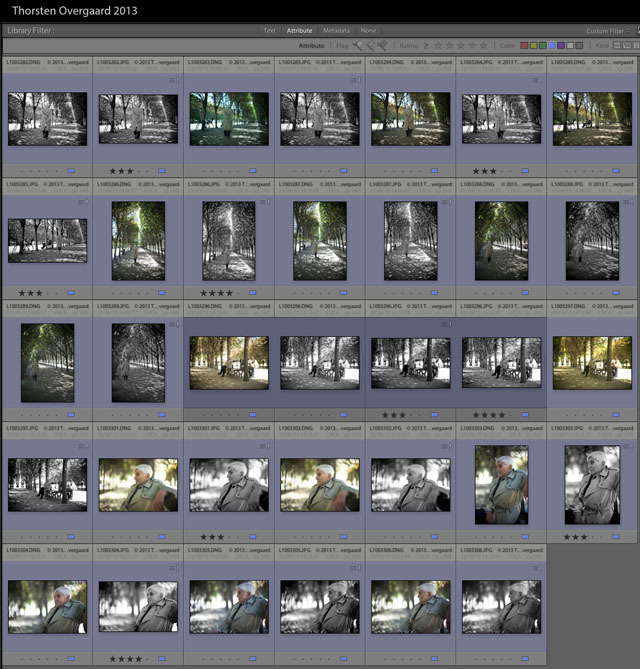 I did 17 photos, all in color and black and white at the same time (a setting in the Leica M 240 allow you to shoot color and black and white imaeges at the same time). Some times you have less than a second, other times you realize you have minutes. But you don't know till later if it is one or the other. So you shoot as if you had seconds. If you first have to consider if it is a photo or not, and then check focus and all settings, the photo opportunity may not exist anymore. You must act rather than think, and control all the technical things. Last week I was in Paris with my workshop and we had arrived at the very peaceful Palais Royal which is a park in the center of Paris, in the 1st district. It is a surprise for even locals that it exist, so take a note. A very peaceful oasis where one can sit and read, have a coffee or lunch outside. It is also a nice route to walk home from the city of, so as to wash off the noise and all the impressions. I did a series of photos in the shadow, playing with the sun and shadows. I waited for intersting people to walk into my focus and had set focus and exposure so it was just a matter of waiting. After having done this for a while I decided to join the others for lunch at the cafe. 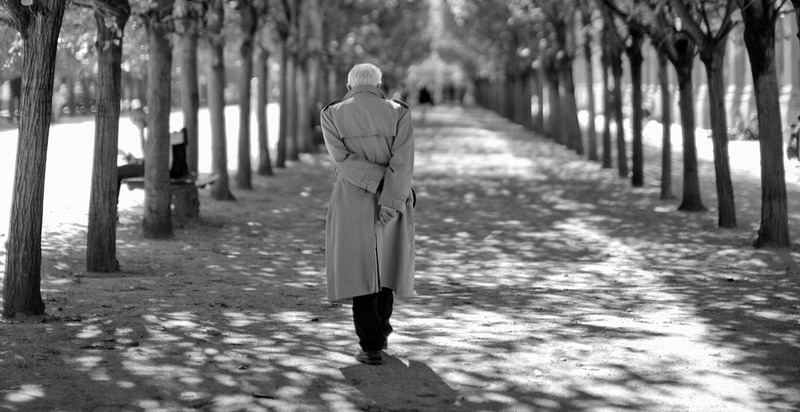 But as I walk away, this gentleman in cottoncoat comes walking slowly from behind. As I had left my watch, so to say, I had to run after him and then with the camera in front of me, follow him and keep focus whilst I tried to work out a framing. I wasn't satisfied, so I returned to the others and the food. 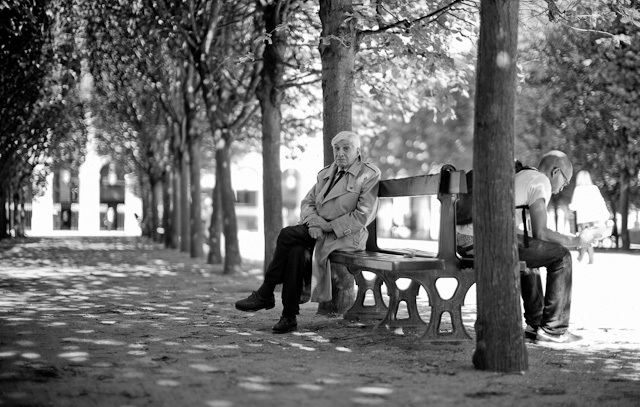 But then noticed that he hat sat down on the very bench I had shot earlier. So I went back to make a good frame of him on the bench, which he obviously noticed but didn't mind the attention. But I still wasn't satisfied. You know, there is this subject that you know should work, but you have to find a frame and an expression that works. As he obviously sat still, so he wasn't the problem. Nice, but somehow not what I was looking for. He is sort of paying too much attention. Leica M 240 with Leica 50mm Noctilux-M ASPH f/0.95. I decided to do a portrait, and as I wanted to sit in front of him on the bench and do it, I of course sat down and asked. He still didn't mind. So I did some portraits and I was sure that was the photo. "I got it", I thoug. Time for lunch. Later I looked at the pictures I had gotten and was happy with the portrait but felt the cropping was too tight. I had been to close. I knew how he looked and that he was sitting on a bench in a park, in a cottoncoat. But the viewer of the image couldn't know, and the crop was to tight to get the atmosphere and the rest of the history. I should have looked at the image in the viewfinder and not only at the image in my own mind. The bench photo was kind of ok, but something was lacking and the expression was not the one I had seen. The first photo of him seen from behind was the one that had the best atmosphere. Leica M 240 with Leica 50mm Noctilux-M ASPH f/0.95. 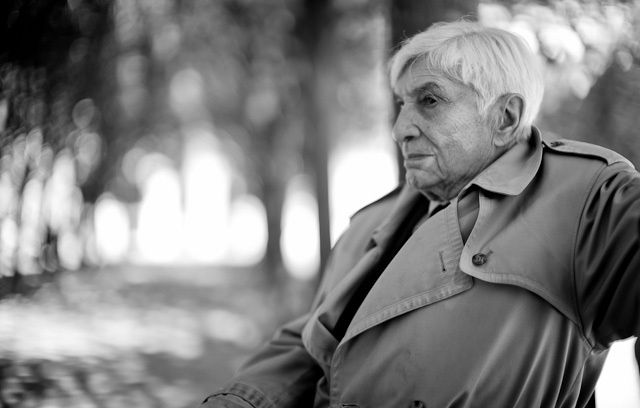 © 2013 Thorsten von Overgaard, Paris, September 2013. Surprisingly, the initial photo I took whilst walking/running behind him was the one that had the best atmosphere. Despite all the time and planning I had for the other photos. The overwhelming light compared to the shadows, the heat from the sun, the quietness, an old man with life experience walking through the park in perfect balance. That worked. When I did it I felt it was wrong that I didn't face him from the front as that was the type of images I had been 'sitting on my watch' waiting to get: People walking towards me, into focus within the framing and composition I had decided for.